Has this happened to you? You go to a networking meeting. Someone approaches you who is well dressed and well spoken. They extend their hand and all of a sudden you find yourself holding a wet fish. Yuk! Nothing will sabotage a good first impression faster than a limp, weak handshake. Don't get me started! I talk about handshakes in every presentation, speech, seminar and coaching session because it's so important. I coach leaders on executive presence and work with executives on their interviewing skills. If you have a weak handshake you've just conveyed a negative impression. First impressions count. You may not have another opportunity to influence. Your presentation is your brand and your handshake is an extension of your brand. Would you trust a leader who didn't have a firm handshake? Yes, men and women shake hands differently. I tell men that women will not break if they shake their hands with some pressure. I tell women that men are not there to kiss their fingertips. A handshake is an equal opportunity communication. It's the same for both genders. A handshake is a little thing that anyone can master in minutes. 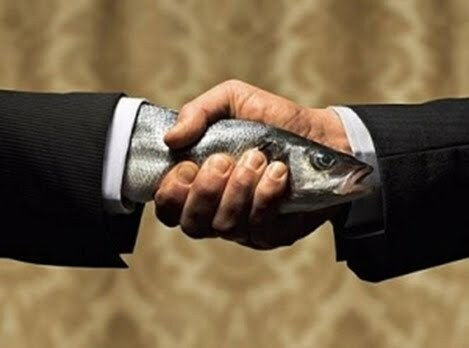 So why is it that even after practicing a firm handshake people revert back to being a wet fish? They don't realize that the real message is in the body language and not the words. You can say all the right things in an interview or sales call. You can have an outstanding resume or product. But if you shake hands like a wimp that is what they remember. It's an emotional reaction and people will be swayed by their feelings. When my nephew Michael was 14, we brought him to a golf course to get a job as a caddy. Michael, being shy, reached out and offered a weak handshake. The caddy master gave him his first lesson in life. He said, "Shake my hand like you mean it." From then on Michael gave a firm handshake. It's a little thing and as I always say, it's the little things that make the greatest impact. So if you want to make a good first impression, shake hands like you mean it!